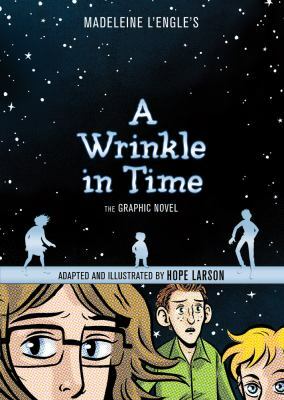 A Wrinkle in Time was published 50 years ago, and won the Newbery Medal for children’s literature. I don’t know when I first read it, but probably around 6th grade, as my mother used to read it to her class of 6th graders. Now there is a graphic novel version, adapted and illustrated by Hope Larson. One dark and stormy night ugly duckling freshman Meg Murry and her little brother Charles Wallace meet Mrs. Whatsit, who is staying with Mrs. Which and Mrs. Who in an abandoned house rumored to be haunted. They make friends with Calvin O’Keefe, two years older than Meg. Together they travel through space and time to rescue Mr. Murry, a scientist who is stuck on another planet. Charles Wallace, Meg, and Calvin learn to use their strengths and their faults on their adventure. A classic for all ages, I was pleased to find that the graphic novel is just as interesting as the original. Whether you read the original book as a kid or not, either the book or graphic novel is well worth reading. Now I just need to figure out which version my 6th grade niece would enjoy most.